Harold Garcia is a pure hitter. He has solid gap power, plays with a ton of energy, and takes the game seriously. He posted a .281 mark with five home runs and 32 RBIs in 55 games for the R-Phils last season — after breaking a 59-year-old Florida State League record by hitting safely in 37-straight games as a member of the Threshers earlier in the season. This season, he was once again off to a solid start, as he was hitting .300 with two home runs, four RBIs and two steals through 12 games. Unfortunately, things changed last week. On April 19 against the Erie SeaWolves at FirstEnergy Stadium, something happened. Garcia, who was 0-2 in the game at the time, came to the plate in the bottom of the fifth inning with Reading trailing Erie 4-2. The Venezuelan native dropped down a bunt and hustled to first base. He collided with Erie first baseman Michael Bertram, for what turned out to be more than just a single. Garcia and Bertram went down in pain, but it was Garcia who took the brunt of the hit. He was helped off the field and would not return. It was the last game he appeared in. The injury proved to be significant, as the Phillies placed Garcia on the disabled list today with a torn ACL in his right knee. A tough break for a great individual. If anyone could come back from an injury like this, it’s Garcia. His athleticism, his energy, and his strong work ethic are examples of someone who could come back from this. 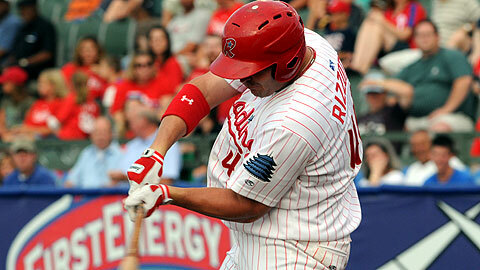 From a team standpoint, the Reading Phillies will certainly miss his bat in the lineup. Fidel Hernandez, however, has filled in admirably. Hernandez is now batting .297 over 13 games. He is currently in the midst of a four-game hit streak and over that span, he has six hits. It remains to be seen if the injury will affect the R-Phils lineup — a lineup which leads the Eastern League in nearly every offensive category. What a week it has been. It is officially now one full week since the R-Phils opened FirstEnergy Stadium on April 14, 2011. The night was one for the ages. Fans flocked to the ballpark to see the AWESOME offseason stadium renovations, as well as the opportunity to win a Life-Size Ryan Howard Garden Gnome. One lucky fan won the life-sized collectible, and earlier today, that fan received the Reading Phillies giveaway– the 550 pound Ryan Howard Garden Gnome — what a masterpiece! Amy Vandehei of Rosemont, PA, waited patiently at her house today for the once-in-a-lifetime opportunity. The giveaway, which was sponsored by Fromm Electric, made it to Amy’s house at 2:00 PM on Thursday in front of family and friends. It was well-receieved by all today! As Amy waited for the Fromm Electric truck, as well as some Reading Phillies employees to deliver the gnome, she prepared a spot in her yard for the “Gnome’s Home”. The spot, which also had two other Ryan Howard Graden Gnomes (last year’s version and this year’s version #2), looked perfect for any Phillies fan. “Gnome Sweet Gnome”. Amy received some media attention from all of this as well. WFMZ was on-hand to talk to Amy about her new collectible. WFMZ’s Melissa Fullerton talked to Amy, and that interview aired earlier tonight on both the 5:30 and 6:00 news. Video of that can be found here. I was also there today to represent the R-Phils. I’m glad I was there. It was truly a great day, seeing how happy Amy was when we delivered it. It’s great to be able to do something like this. Only at the Reading Phillies! Here are a few photos of Amy and her new best friend. Once again congratulations to Amy. 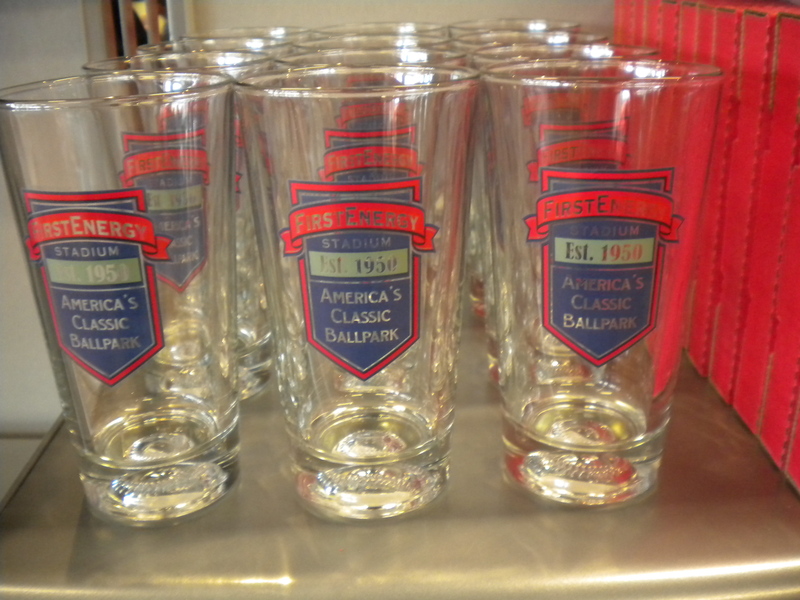 We here at the Reading Phillies are happy that Amy, along with her family, will get to enjoy this great giveaway! Opening Night 2011 — WOW! Wow, what an amazing night at FirstEnergy Stadium on Thursday. This was truly an Opening Night that fans will remember for a lifetime. Everything that took place tonight was memorable. From the minute the day began, things were really falling into place nicely. The staff put the finishing touches on some of the signange around the ballpark, and this place was more than ready to open at 3:50 p.m. Media members were here all day — lots of great coverage! WFMZ 69 NEWS was amazing. They trully did an awesome job capturing everything. The Reading Eagle was outstanding as well. They were here early and took some great pictures for the commerative poster, which we handed out in the SAME NIGHT! That was amazing. Great job by everyone at the Reading Eagle. Thanks to all of the other great reporters and photographers, who came out and got some great stuff as well. The Pottsville Republican-Herald, Pottstown Mercury, and many more. Service Electric also did an amazing job capturing everything. Great coverage as usual from them! It was a long offseason, but it was all worth it — every second of it! Fans began lining up early today and just seeing the expressions on their faces, meant that the renovations were a success! So many happy faces and so many fans excited about the new season. Also, as part of the evening, there were many fans waiting to get their hands on the Ryan Howard Garden Gnomes — and at the end of the day, 3,500 adults received the instant collectible. And, one lucky fan won the Life-Size version — amazing! A few more things that fans will always remember about Opening Night 2011 — the awesome commerative Reading Eagle poster, the Dance Team poster, and great performance by the Dance Team, live ostriches — yes real live ostriches, the press box window shattering after being hit by a foul ball, and the return of baseball in Baseballtown — perhaps the greatest place to play. Wow — what a night! And, here are some photos from the evening. Enjoy! FirstEnergy Stadium on Wednesday, just in time for all to see on Thursday evening. It was truly a sight to see today. After unwrapping it and taking it out of the box — very carefully I may add, the Gnome was “alive”. ﻿On Opening Night, fans will get to see this masterpiece up-close. And, when they see it, they are going to love it. It really is everything we hoped for! One lucky fan is going to win this Life-Size gnome on Opening Night! All fans that come out to America’s Classic Ballpark on Thursday will get a FREE entry form and will have the chance to win this ultimate collectible. Good luck to everyone! Here is a sneak peek of the gnome fron tonight’s news — WFMZ 69 NEWS ﻿. Here are some of the pictures I took from his journey around FirstEnergy Stadium. Enjoy! 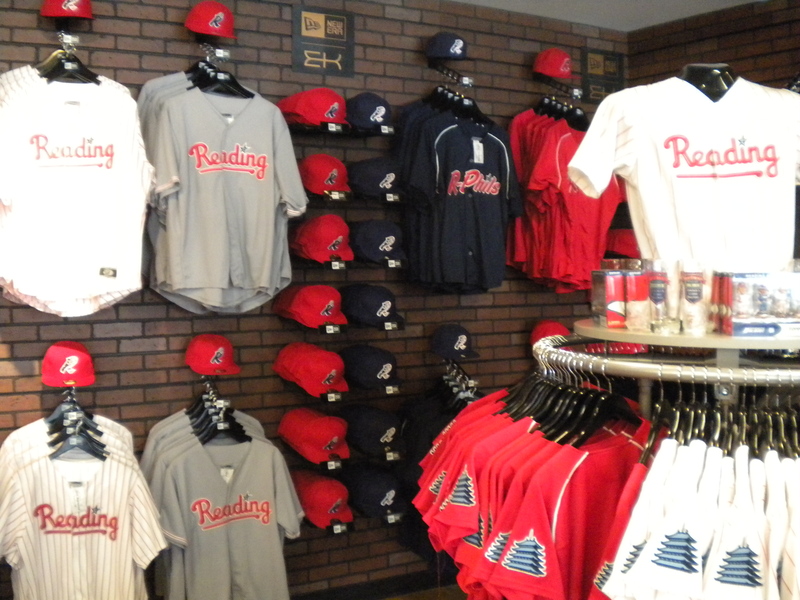 Mitchell & Ness R-Phils Team Store for the first-time ever. 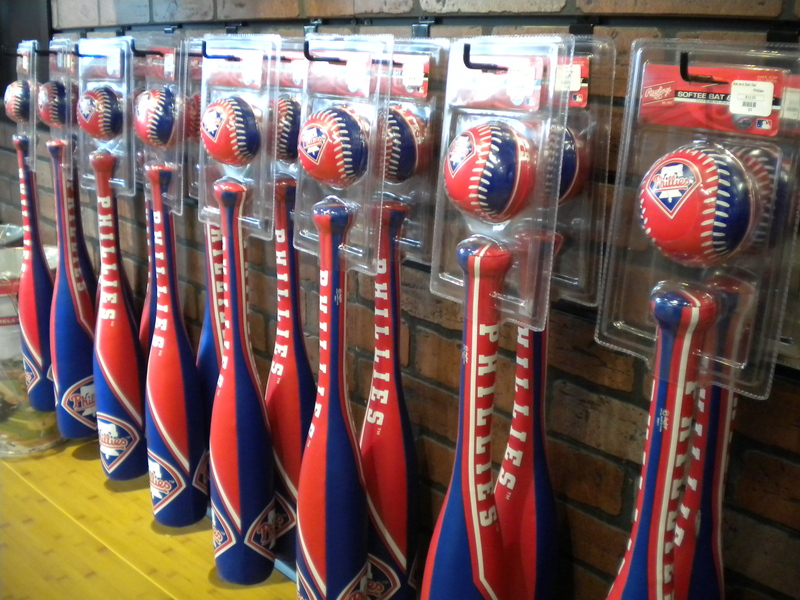 Fans began lining up early to get their hands on some great new R-Phils merchandise. R-Phils GM Scott Hunsicker welcomed everyone out and at 10:00 a.m., Mike Stoudt Jr., the Redner’s R-Phils Kids Club member who won an R-Phils Phan Pack, cut the ceremonial ribbon in front of the brand-new store. Stoudt Jr., as well as all of the fans in attendance, made their way through the brand-new climate-controlled store and loaded up on everything from hats, shirts, sweatshirts, and more. Watch the video of the new Mitchell & Ness R-Phils Team Store and don’t forget to come out and shop here before the season! Here are the store hours, as well as some great photos from today’s grand opening. Monday – Friday 10:00 p.m. to 6:00 p.m.
Saturday – 10:00 a.m. – 4:00 p.m. Check out some great photos from today’s grand opening, courtesy of R-Phils Team Photographer Ralph Trout. Things are really exciting around here in Baseballtown. There are so many great new features here at the ballpark and we are excited to be able to share them with you. I really can’t wait for Thursday, Aprtil 14 — it is going to be the most memorable opening day in the history of this franchise. Wow! After walking around the Mitchell & Ness R-Phils Team Store earlier today, that was my reaction — wow! 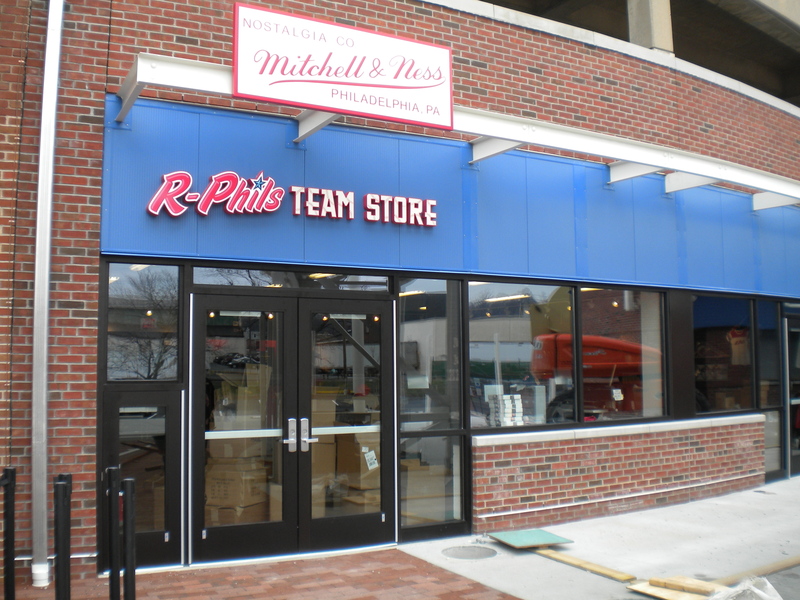 The Mitchell & Ness R-Phils Team Store is the first team store in R-Phils history. Never has there been a climate-controlled team store here at FirstEnergy Stadium. 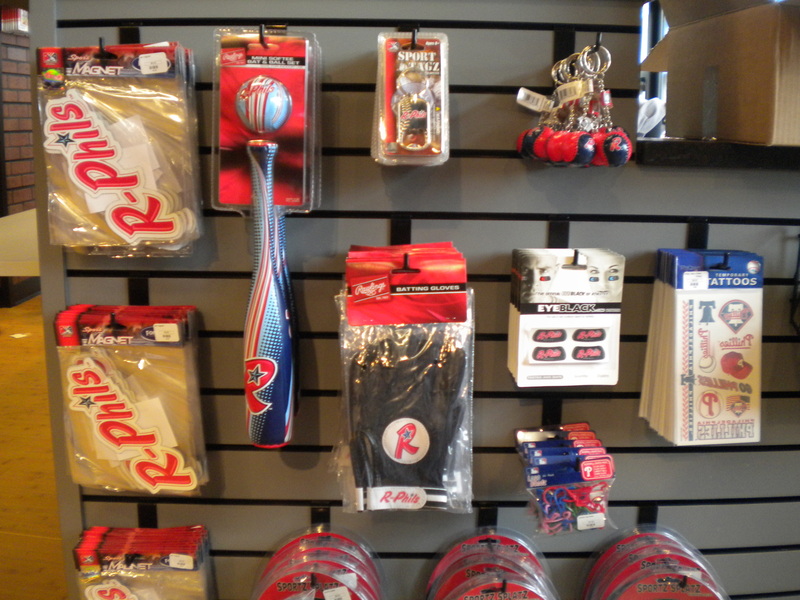 The store is filled with great R-Phils gear, Philadelphia Phillies gear, and great Mitchell & Ness gear. R-Phils Director of Merchandise Kevin Sklenarik and R-Phils Team Store Manager Jason Yonkovitch have really done an outstanding job of ordering items for the store. There really is something for everyone! Perhaps the best news of all is that the Mitchell & Ness R-Phils Team Store opens on Saturday, April 9. There will be a special grand opening at 10 AM with a ribbon-cutting ceremony. For more information, please see my press release. 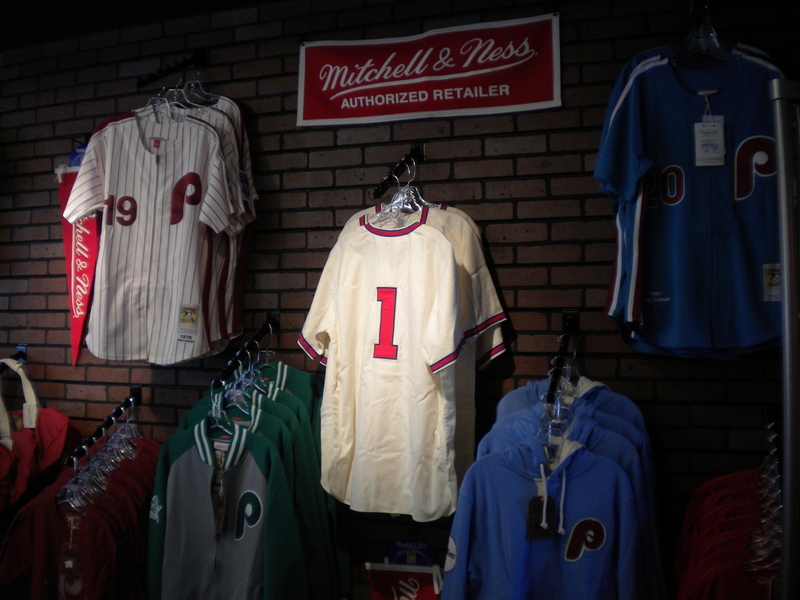 Also, please take a minute to view the video of the new Mitchell & Ness R-Phils Team Store. 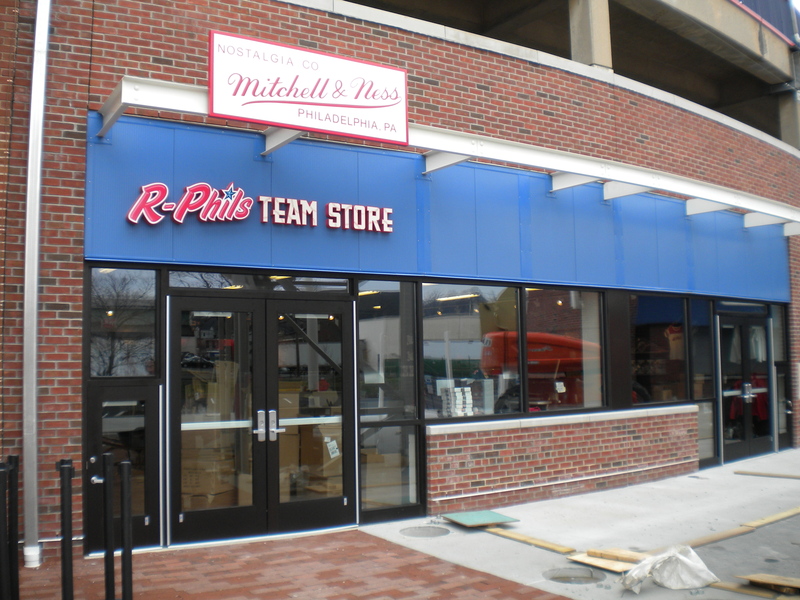 Beginning at 10:00 a.m. with a special ceremonial ribbon-cutting ceremony, all fans will have the chance to enter the new Mitchell & Ness R-Phils Team Store for the first-time and purchase some great gear. Reading Phillies mascots will be in the store to greet everyone on Saturday. Also, any fan that makes a purchase on Saturday will get a free tour of FirstEnergy Stadium. Fans will get an early look at the results of the awesome stadium renovations before Opening Night, which is Thursday, April 14. I took a few photos of the store today. Back in Lehigh Valley for a few hours today for the exhibition game. I got my start here in 2008 as t he radio producer and Media Relations Assistant. Nice to come back and see all the old faces. Talked with a few of our players before the game. I’m looking forward to a great season. We have a talented bunch of guys this season. J.C. Ramirez allowed four runs in the bottom of the fourth inning. Reading was down 4-0 after just one inning in Allentown… Ramirez ended up taking the loss as he allowed four runs on seven hits over three innings pitched… He fanned two and walked none… Other pitchers for Reading on Tuesday including Mike Cisco (1 IP, 1 H, 0 ER), B.J. Rosenberg (1 IP, 2 H, 2 ER, 3 K), Jake Diekman (1 IP, 1 H, 0 ER, 1 BB), Phillippe Aumont (1 Ip, 1 H, 2 BB, 2 K), and Justin De Fratus (1 IP, 0 H, 0 ER, 1 K). 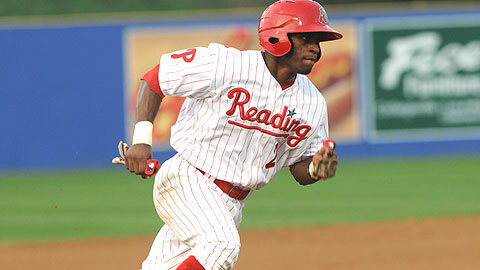 The R-Phils will now travel to Portland on Wednesday for the first regular season series of the 2011 season… The club will open the season against the Sea Dogs on Thursday evening… First-pitch of Thursday’s game is 7:05 p.m… Josh Zeid will get the nod for Reading in the opening game… Reading will face Sea Dogs RHP Alex Wilson, who will get the nod in the opener for Portland… Join R-Phils play-by-play broadcaster Brian Seltzer for the call beginning with the R-Phils pre-game show at 6:35 p.m. Baseball is back and tonight, the R-Phils will face the Lehigh Valley IronPigs in the fourth edition of the 222 Showcase at Coca-Cola Park in A llentown. All R-Phils fans can tune in to ESPN Radio 1240 AM WIOV for all the action all season, including tonight’s exciting exhibition game. Join R-Phils play-by-play broadcaster Brian Seltzer, who will have the call beginning at 6:05 p.m. for the R-Phils pre-game show. 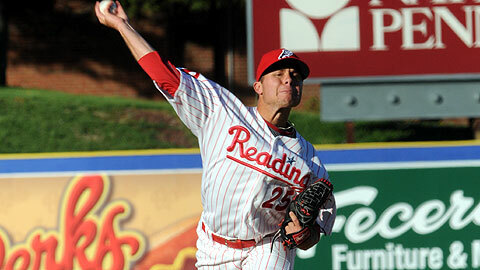 First-pitch is set for 6:35 p.m.
RHP J.C. Ramirez will get the start for Reading in tonight’s matchup. 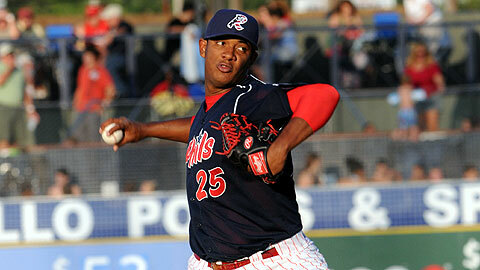 Ramirez, a native of Managua, Nicaragua, posted a 3-4 mark with with a 5.45 ERA in 13 starts for the R-Phils a season ago. The 22-year-old began the 2010 campaign with Clearwater (A+) and went 4-3 with a 4.06 ERA over 11 starts. RHP Brian Bass will toe the rubber for the IronPigs in tonight’s exhibition. Bass, 29, spent 2010 with Indianapolis (AAA) and posted a 4-4 mark with a 3.26 ERA over 41 games (one start). The Pinehurst, NC native appeared in four games for the Pittsburgh Pirates last season and went 0-0 with a 12.27 ERA. Make sure to check back here all evening for all the latest news and notes. I’ll be in the IronPigs press box with live updates throughout the entire game. Follow me on twitter for all the up-to-the-minute scores and highlights all evening.